The Chaos Game is a method of generating the attractor of an iterated function system (IFS). One of the best-known and simplest examples creates a fractal, using a polygon and an initial point selected at random. Play the Chaos Game using the corners of an equilateral triangle as the reference points. Add a starting point at random (preferably inside the triangle). Then add the next point halfway between the starting point and one of the reference points. This reference point is chosen at random. 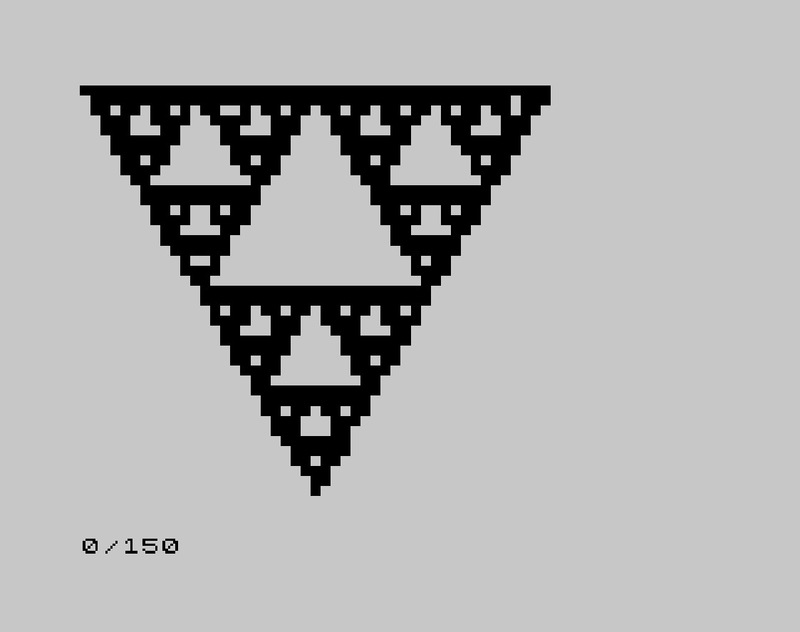 After a sufficient number of iterations, the image of a Sierpinski Triangle should emerge. This should require minimal adaptation to work with any of the older Microsoft-style BASICs. Users of other dialects will need to replace lines 10 and 150 with the appropriate statements to select a graphics output mode (if necessary) and to plot a pixel at x,y in colour v; they should also add LET throughout and 170 END if their dialects require those things. Adapted from the code given above. Adapted from the other BASIC versions. Monochrome and low-resolution, of course. Works with only 1k of RAM. If you like, you can try changing line 30 to go round the loop a different number of times. Note that ZX81 BASIC does not have an explicit computed GOTO; we can, however, actually compute the value of an expression and then GOTO it as a line number. Screenshot here. As with most ZX81 graphics, you can obtain the very best results by making it quite small and looking at it from a long way away. The final INK statement sets the foreground colour back to black. Interactive code which asks the side length of the starting triangle and number of iterations as inputs, a larger number of iterations produces a more accurate approximation of the Sierpinski fractal. Requires the WinBGIm library. 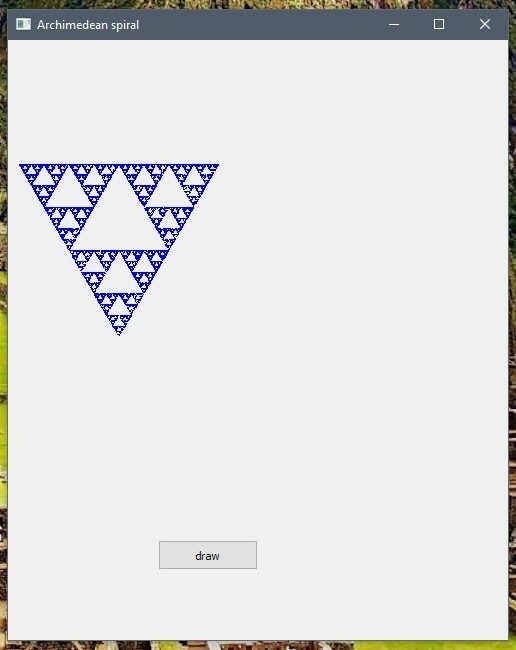 This program will generate the Sierpinski Triangle and save it to your hard drive. This writes a simple GIF animation of the method. // Make a filled triangle. // Stuff for making a simple GIF animation. j has a particularly rich notation for numbers. at an angle of negative 90 degrees. 2p1 is 2 times (pi raised to the first power). Plots the fractal on an HTML canvas element. Note: Find plotmat() here on RosettaCode Wiki. # :degree must be equal to or less than @xy elements. Implements five of the fractals on the wikipedia page. width and depth of the terminal (console). Some REXXes don't have this BIF. The SCRSIZE.REX REXX program is included here ───► SCRSIZE.REX. This script uses complex numbers to represent (x,y) coordinates: real part as x position, and imaginary part as y position. It outputs a graphic window and prints on the console the time elapsed during iterations. This is a half assed animated process - a bunch of pixels are drawn every couple of seconds and the pixmap written [to the file system]. So, if you open the output file ("chaosGame.jpg") it will [auto] update and show the progression of the image. This page was last modified on 14 March 2019, at 20:14.